do not appear in the search results obviously. Re: The folders / drives in the folders indexes do not appear in the search results? Is Everything finding any results on your Z: drive? -If you search for z: are any results shown? Yes, there are results but that is because Everything uses the NTFS indexes, I think. Actually some items should be shown in the results twice or three times (NTFS and the two folder indexes). When I enter "Z:\Filme" in the search field the content is shown but there seems to be missing some items. And all of those items should be shown twice (NTFS and folder indexes). How could I find out which of those indexes is shown in the results? 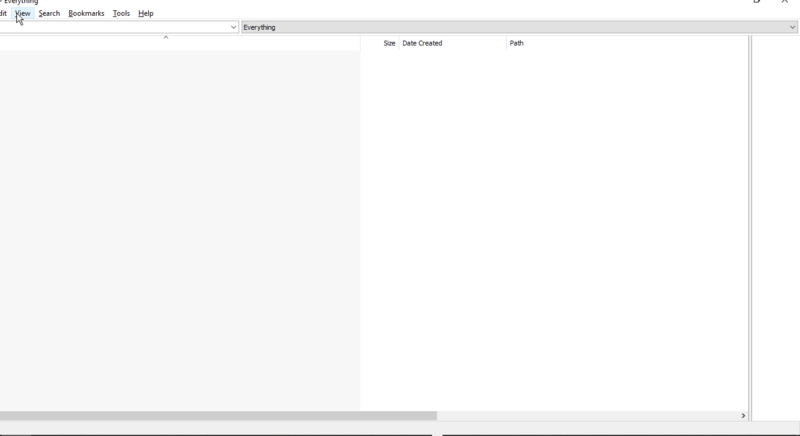 May be, because of the drive letters not being removed when the drive is removed Everything shows the drive to be empty. 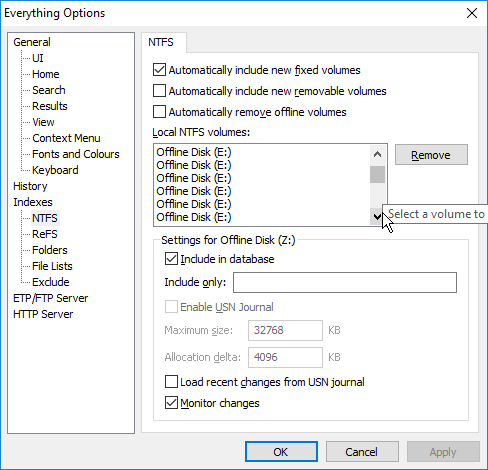 NTFS volumes are automatically included, you should be seeing double results for your Z: drive and triple results for files under Z:\Filme. How could I find out which of those indexes is shown in the results? It may take some trial and error to find the correct index. 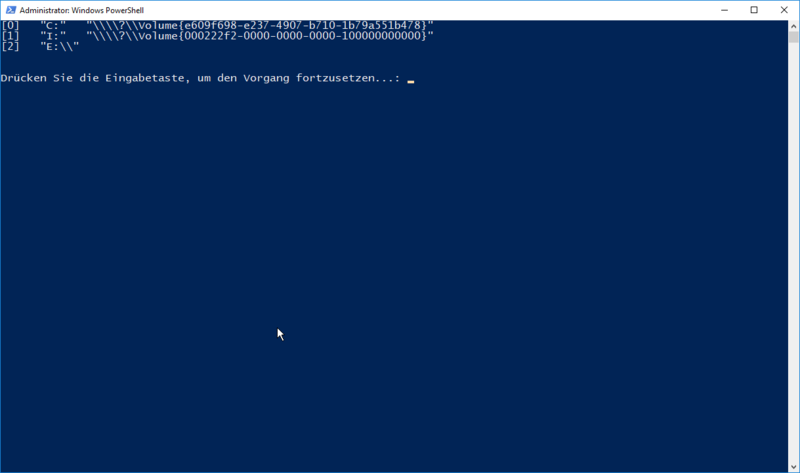 Start with searching for fsi:0 then fsi:1 then fsi:2 and so on..
0 will be your first NTFS index, 1 your second NTFS index and 2 your third NTFS index and so on. 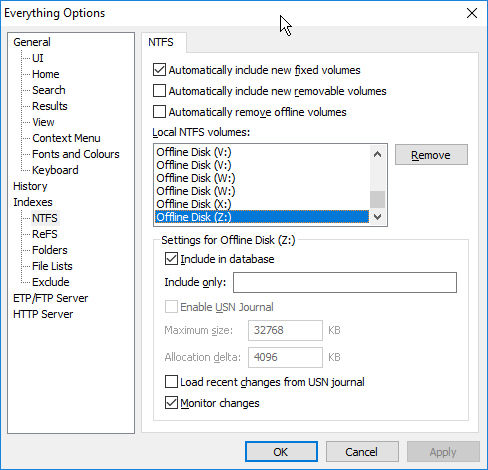 After your NTFS indexes, fsi: will start referring to your folder indexes, so you might find fsi:3 is your first folder index. The indextype:folder search function will be available in the next release of Everything, which will make this easier..
All folder indexes should be shown in the results by default. Wait for rescanning to complete. Do you see the expected results when searching for Z:? Yes, but I don't. Sorry, I meant folders indexes, are they added automatically? So this will find the folders indexes? How could I recognize a folder index, distinguish a folder index for Z: and a NTFS for Z:? I have about 30 NTFS indexes here, it acutally should be about 20, 25 indexes (drives) or so. So when I create a filter I would do it the same way I would do with a NTFS index as with a folder index. If I would add to the filter "Z:\Filme" both indexes would be found, the results would shown twice. I have tried it with another, new index, yes, they, the results are shown twice. Biff wrote: If I would add to the filter "Z:\Filme" both indexes would be found, the results would shown twice. I wrote a script once to enumerate the FSI's, like FSI(0) = C: ; ... ; FSI(23) = "Z:\Filme". Might be useful if you have a lot of drives and folders to index. I am not quite sure to understand. fsi:0 to fsi: 2 shows a result fsi:3 does not and the higher numbers do not, too. Sorry, I do not understand, what for is that script? Enumerate? the FSIs? Yes, I hope Everything will find it. Here Everything does not work properly anymore because of the problems with the drive letters all the time. OK, thanks for the script. Oops, alright, illegal activities here, hope you can hack the forum / the Internet and upload those, cannot wait for it, thank you. EDIT: Can't post the code. Everytime I get blocked (=no longer allowed on the voidtools website). The script is now in the attachment. When I press ENTER the window disappears. fsi:23 shows the content of S: obviously. Would you send me your Everything.ini so that I can analyze what's going wrong? Very sorry, didn't made it to upload the ini yesterday, couldn't upload a txt, ini, even zip didn't work or another extension or entering the code in the post, then I got totally blocked from this entire web site, do not know what sense this makes. I hear you! That's the same thing that happened to me (about 20 times ...). That new "voidtools-police" (BitNinja) is *very* strict! As soon as it detects some 'illegal' text, you will be blocked. Unblocking has to be done by answering a captcha (in my case even in a separate browser, due to my Firefox settings). I think that next time, if you zip the INI file and post that .zip (you could also send it to me through a private message , if you like that better) things should be OK.
Unblocking has to be done by answering a captcha (in my case even in a separate browser, due to my Firefox settings). Yes, those re-captchas. I am not able to solve them, the picture windows keep on occurring, there were times I was able to solve them after 7, 8, 15 windows, sometimes 4, 5 or so, but that was too much effort, since some months I do not try to solve any captchas anymore and will never again, very cruel those captchas (and I do not like to work for Google or such). Yes, I would do it, good idea, thank you. That means I clearly have no idea about the inner workings of how the disks/folders are defined in Everything.ini OR you use a different INI file with your Everything (there must be more explanations, but those two are the only ones I can come up with at the moment). Unbelievable, where is the second one? One is in the post above, I cannot see the other one. Thanks for saving me from an identity crisis! This new INI makes a lot more sense! When you enter that in the Everything search bar, you should get the content of your Z:\Filme. I will take a closer look at your INI, as there are quite a few disks (volumes) defined multiple times. H: and one of the E:'s for example. No no, no reason to say thank you...now I have one. Now I see, that is very great, many thanks! Many thanks. Yes, because the drives very often lose their assigned drive letters and Win automatically obvioulsy assigns E: then.